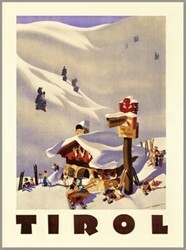 Tirol Austria Ski Poster. Tyrol (German: Tirol) is a state or Bundesland, located in the west of Austria. It comprises the Austrian part of the historical region of Tyrol. The state is split into two parts – called North Tyrol and East Tyrol – by a 20 km-wide strip of land where the state of Salzburg borders directly on the Italian Province of Bolzano-Bozen (Alto Adige/South Tyrol). North Tyrol borders Bavaria (Germany) in the north, the state of Vorarlberg in the west, Italy and Switzerland in the south and Salzburg in the east. East Tyrol also borders Carinthia in the east. The highest mountain in the state is the Großglockner in the Hohe Tauern, with an elevation of 3,798 m (12,461 ft.). This is second only to the highest mountain of South Tyrol, the Ortler, 3,905 m (12,812 ft.). The capital is Innsbruck. 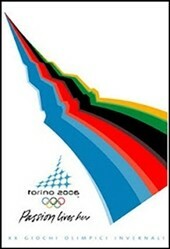 The city is known for hosting two Olympics, 1968 and 1976. 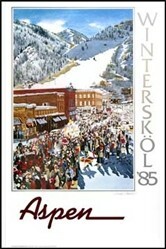 When Denver voted down the already awarded games in 1976, Innsbruck was able to host them for the second time. Tyrol is popular for its famous ski resorts, which include Kitzbühel, Ischgl and St. Anton. Other larger towns are Kufstein, Schwaz, Reutte and Landeck.